For soprano Xin Wang, singing contemporary music has always been about personal growth. But for many performers, making a career out of music can mean playing what they are told to play, rather than directing that personal growth themselves. So when Wang decided to start a contemporary music series in Toronto this year, she knew it had to be something different. TO.U Collective is Wang’s “something different” project – a seven-concert season of solo recitals at St. Andrew’s Church, featuring professionals from the local music community. The focus of TO.U – its name both a Chinese character meaning “through” and a play on “Toronto/You” – is on highlighting contemporary music’s personal relevance, both for audiences and for the artists who perform it. 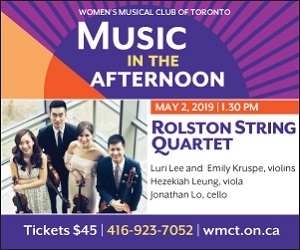 The premise is simple: seven professional musicians, each with a personal connection to new music, will perform seven recitals of contemporary repertoire that matters personally to them. The recitalists curate their own concert programs, and are asked to emphasize music that has shaped their own lives and work. Wang opens the TO.U season next Wednesday, October 19, with a free noon-hour recital of works by Schubert, Webern, Berio, Aperghis and Gubaidulina. Before her performance, she intends to speak briefly about how this music has impacted her life, not only as a recitalist but also as an artist and a mother – presenting her work as the evidence of her own, complete personhood. And she hopes that the other recitalists – clarinetist Max Christie, cellist David Hetherington, pianists Stephanie Chua and Stephen Clarke, and guitarists Graham Banfield and Rob Macdonald – will do the same. Xin Wang opens her TO.U Collective series with a free noon-hour concert on Wednesday, October 19 at St. Andrew’s Church, followed by a ticketed, full-length evening recital by clarinetist Max Christie on Saturday, October 22 at 8pm. For details on the series and a full lineup, visit www.toucollective.com. Learn how you can help support The WholeNote – publisher David Perlman explains. It's already been a big year for Against the Grain Theatre. Now in its seventh season, the indie opera company has announced two big productions this year, plus a residency at the Canadian Opera Company as part of the COC’s pilot company-in-residence program. And tomorrow, they launch Opera Pub – a monthly music night that brings opera into an alternative space. Starting Thursday, October 13 at the Amsterdam Bicycle Club and continuing the first Thursday of every month, Opera Pub presents live performances of operatic repertoire by established and emerging singers, in an atmosphere less formal and more personal than the concert hall. The concept isn’t new – the series follows in the footsteps of companies like the Bicycle Opera Project, Tafelmusik’s BAROQUE + BEER initiative, and beer specialist Mirella Amato’s “Hopera” series – but it does point to an encouraging trend of embracing the versatility of live classical music, and the value it can have when it’s up-close, scaled-down, and out of the opera house. It’s a format that seems to work, and that is worth exploring. The AtG pub night series will have no cover, $3.50 bottles of beer, and an ‘open house’ policy – allowing opera audiences and walk-ins to treat the performance as a no-strings-attached portion of a Thursday night out. Tomorrow’s Opera Pub set starts at 9pm, and runs until around 11pm -- for details, visit https://www.facebook.com/events/627490814075092/. For more info on the rest of Against the Grain’s 2016/17 season, head to www.againstthegraintheatre.com. 9:00: Against the Grain Theatre. Opera Pub: October Edition. Solo and small-ensemble opera performances in an informal pub atmosphere. The Amsterdam Bicycle Club, 54 The Esplanade. Free. 7:00: Feldsperling Duo. Toward the Heart of Sound. Lemay; Scelsi; Yun; Clarke; Mendez. Liesel Deppe, flutes; Nicole Strum, saxophones. Array Space, 155 Walnut Ave. 519-272-9633. $15. 9:00: BAL(folk). BAL(folk)Masqué with La Forcelle. Polish Combatants' Hall, 206 Beverly St. 416-937-6198. $15; 2 for $25. Doors/dance lesson at 8pm. 2:30: Beach United Church. Music for the Soul. Lora Bidner, vocalist/songwriter/instrumentalist; The Visit: Heather Sita Black, vocals; Raphael Weinroth-Browne, cello. 140 Wineva Ave. Freewill offering. 7:00: Canadian Bandurist Capella. Bandura in Waterloo! Ukrainian folk and contemporary music. Canadian Bandurist Capella; Dibrova Women's Choir; Levada Women's Choir; and others. Maureen Forrester Recital Hall, 75 University Ave., Waterloo. 416-845-2691. $25(adv)/$30(door). The next issue of HalfTones will be out on Wednesday, November 16. The next print issue of our 2016/17 season, covering November 1-December 7, will be on the stands at the end of October. Please contact halftones@thewholenote.com with any HalfTones inquiries. Sara Constant is a Toronto-based flutist and musicologist, and is digital media editor at The WholeNote. She can be contacted at editorial@thewholenote.com.